Delta Air Service was formed in 1928 with an investors' buyout of Huff Daland Dusters Inc. The airline’s headquarters were in Monroe, Louisiana, until it moved to Atlanta, Georgia, in 1941. 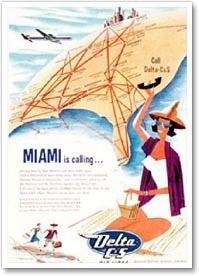 The carrier changed its name to Delta Air Lines in 1945. In 1990, a group of Delta retirees launched an effort to locate one of Delta's first 1940s Douglas DC-3 aircraft. This combined with an effort to consolidate Delta's memorabilia and archival collections, created a groundswell of support that expanded into a museum. Today it survives with volunteer assistance and charity donations. On 23 May 1995, the Delta Air Transport Heritage Museum Inc, was incorporated as an independent non-profit corporation. It is devoted to collecting and preserving the history and heritage of Delta Air Lines and all of the airlines that have merged with Delta in the past. This includes Chicago & Southern Air Lines (1953), Northeast Airlines (1972), Western Airlines (1987), Northwest Airlines (2008), and much information about the acquisition of Pan Am's transatlantic and shuttle routes (1991), arguably a takeover. The museum is housed in a pair of hangars that date back to the 1940s and were the airline’s maintenance and engineering base until 1960. The carrier’s press and public affairs office sits adjacent to the buildings. Hangar 1 houses the prototype Lockheed L-1011 Tristar and its Rolls-Royce RB 211 engines. The aircraft was purchased from the Walt Disney Corporation and cut down to just the cockpit and early 1970s First Class cabin. The cockpit is fully lit with all controls still movable. The cabin is also a museum stop where Delta memorabilia can be purchased. Also in Hangar One is the Monroe Café, a full scale replica of Delta's former Monroe, Louisiana, building. 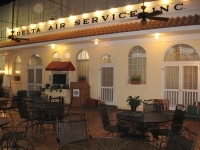 It served as Delta's headquarters from 1934 to 1941 and is now also used as a meeting and dining establishment. The "hub" of Hangar One is the Delta Archives. It houses more than 200,000 images, 1,000 films, one of the world's largest airline uniform collections, as well as an aviation reference library. 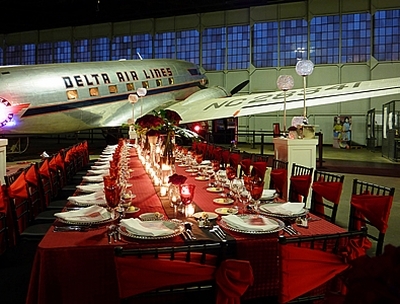 Hangar 1 also houses the museum's restored aircraft which includes Boeing Ship 41, the prize of the Delta museum, which is Delta's first DC-3. Also on display is a 1931 Travel Air 6000, symbolizing the airline's first passenger aircraft. Restored by volunteers and a core mechanic team from 1993-1999, in 2001 it became the original aircraft to be honoured with the National Trust for Historic Preservation award. On show also is a 1936 Stinson Reliant SE. Nicknamed the “Gull Wing,” this unique aircraft served as an instrument trainer for Northeast Airlines pilots in 1941-1942. Hangar Two is home to The Spirit of Delta, B-767. Because the tail of Ship 102 was four feet higher than the support beams in the “tail door” of the hangar, a team of structural engineers modified the roof structure in 2006 to allow Spirit to fit. The hangar also received a much-needed cosmetic change – a fresh coat of interior paint to bring the hangar back to its original “maintenance grey”. This actual aircraft was repainted in a commemorative paint scheme and toured the United States to celebrate the airline's 75th anniversary in 2004. 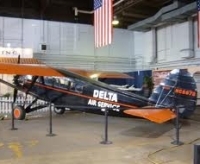 The aeroplane remained the flagship of the Delta fleet until March 2006, when it was retired and donated by the airline to the museum. A slow walk around the hangars is a true travel back in time.